A few odd weeks in 1999 it seemed like the movie values system had turned upside down, most agreeably so. First, Cleveland native Wes Craven, synonymous with gore and horror, delivered MUSIC OF THE HEART, a wholesome, PG-rated music drama, based on fact, starring Meryl Streep (Craven said he finally wanted to direct a film that his conservative parents could see). 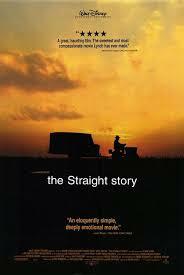 Then David Lynch, a name equated with extreme, transgressive and positively diseased themes in cinema, made a deliberately G-rated all-ages feature THE STRAIGHT STORY. Released by Disney, in fact. get away with under a G rating? drove a riding mower (with a trailer hitch full of fuel and provisions) hundred of miles along country roads, across the state line into Wisconsin, to visit his long-estranged brother who had recently suffered a stroke. Straight stubbornly chugs along at about 5 m.p.h. it becomes clear that this is no Mr. Magoo antic joyride but a meaningful, end-of-life spiritual pilgrimage for a thoughtful old man. From time to time Straight interacts with fellow nomads or residents, dispensing wisdom and comfort in episodes that threaten to turn this road movie into something along the lines of Touched by an AARP Angel. But Lynch (working from a script by his longtime offscreen partner Mary Sweeney and first-time Wisconsin screenwriter John Roach) never lets THE STRAIGHT STORY become so saccharine or prosaic. Probably the movie's single, real flaw is in the casting - not of Farnsworth, weather-beaten and marvelous, but of famed character actor Harry Dean Stanton as Alvin Straight's stricken brother.